24 Apr : The Indian Space Research Organisation (ISRO) is gearing up to launch the GSLV-D3, its new Geo-synchronous Satellite Launch Vehicle with indigenously developed cryogenic engine on 15th April. This historic mission will witness the test flight of India’s indigenously developed Cryogenic Upper Stage (CUS) from Satish Dhavan Space Centre SHAR, Sriharikota. The soaring 170 feet long Vehicle is set to launch 2,220 kg Geostationary Satellite GSAT-4 an experimental advanced technology communication satellite that carries communication and navigation payloads, into Geosynchronous Transfer Orbit (GTO). Envisaged mainly as a technology demonstrator for advanced satellite communications, GSAT-4 will enable the testing of many future communication satellite technologies. After reaching GTO, GSAT-4 will use its own propulsion system to reach its geostationary orbital home and will be stationed at 82 degree East longitude there. This will be a mission that India can proudly boast of. India will be proclaiming to the world its absolute self reliance in building bigger rockets as the third stage of GSLV-D3 is cryogenic and is an indigenously built one. It may be recalled that Cryogenic Stages (CS) procured from Russia were used during the past five flights that included two test flights of GSLV. GSLV-D3 will be the sixth flight of ISRO’s Geosynchronous Satellite Launch Vehicle (GSLV) as well as its third developmental flight. According to ISRO sources, major changes incorporated in GSLV-D3 compared to its previous flights are Indigenous Cryogenic Upper Stage; Advanced Telemetry System and Advanced Mission Computers and Larger Composite Payload Fairing. The 50 m tall GSLV, with a lift-off mass of 416 tonnes, is a three-stage vehicle with solid, liquid and cryogenic stages. The solid core motor of the first stage of GSLV is one of the largest rocket motors in the world and uses 138 tonnes of Hydroxyl Terminated Poly-Butadiene (HTPB) based propellant (fuel-oxidiser combination). The second stage (carrying 38.5 tonnes of propellant) as well as the four strap-on motors of the first stage (each carrying 42 tonnes of propellant) use liquid propellant ‘Vikas’ engine burning UH25 and Nitrogen Tetroxide. The third stage is the most vital. It will be a cryogenic stage carrying 12.5 tonnes of propellants. It will use liquid Hydrogen as fuel and liquid Oxygen as oxidiser. What is Cryogenic Upper Stage? Cryogenic stage is a rocket stage that is much more efficient and provides more thrust for every kilogram of propellant it burns compared to solid and earth-storable liquid propellant stages. Specific impulse (a measure of the efficiency) achievable with cry fluids (liquid Hydrogen and liquid Oxygen) is of the order of 450 sec compared to 300 sec for earth storable and solid fuels, giving a substantial payload advantage; for an upper stage, with every one second increase in the specific impulse, the payload gain is of the order of 15 kg. ISRO scientists say cryogenic stage is technically very complex compared to solid or earth-storable liquid propellant stages due to the use of propellants at extremely low temperatures and the associated thermal and structural problems. Oxygen liquifies at -183 degree C and Hydrogen at -253 degree C.
The propellants, at these low temperatures, are to be pumped using turbo pumps running at around 40,000 rpm. It also entails complex ground support systems like propellant storage and filling systems, cryo engine and stage test facilities, transportation and handling of the cryo fluids and related safety aspects. built by ISRO and fourth in the GSAT series. Its three GSAT predecessors were launched by GSLV during 2001, 2003 and 2004 respectively. After its commissioning, GSAT-4 will join the group of India’s eleven operational geostationary satellites. It will be a new dawn in the history of India’s space programme as GSLV-D3 place the GSAT-4 into the orbit. In the past two and half decades India’s geostationary satellites have revolutionised the country’s telecommunications, TV broadcasting and Weather Monitoring sectors. More recently, ISRO’s INSAT and GSAT series of satellites circling the Earth in the 36,000 km high geostationary orbit have brought in a revolution in India’s healthcare and educational sectors. Besides, they have been instrumental in taking the benefits of space technology directly to the doorsteps of rural India through Village Resource Centres (VRCs). Today, geostationary satellites are an integral part of India’s national infrastructure. The country has about 200 communication transponders in geostationary orbit that operate in S band, C band , extended C band and Ku bands. 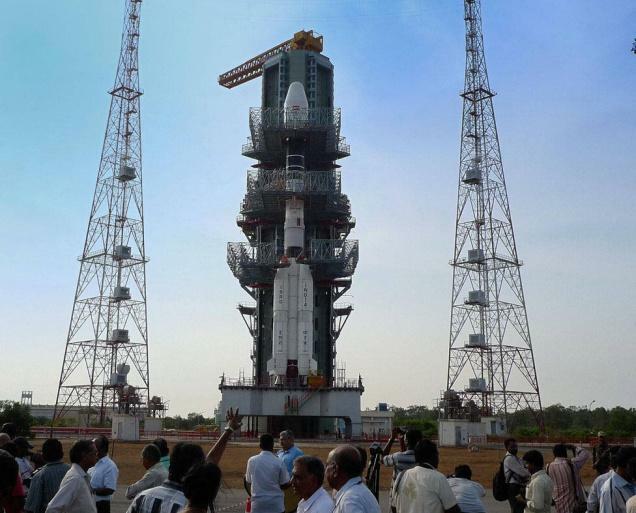 During a pre-launch familiarisation visit last week to Satish Dhavan Space Centre Shri.G.Ravindranath, Project Director of GSLV-D3 said that reaching the testing of indigenously developed cryogenic stage was a big struggle. Fruition of that struggle that lasted for one and half decades will be a momentous one signaling India’s entry into the big league of cryogenic rocket launching.